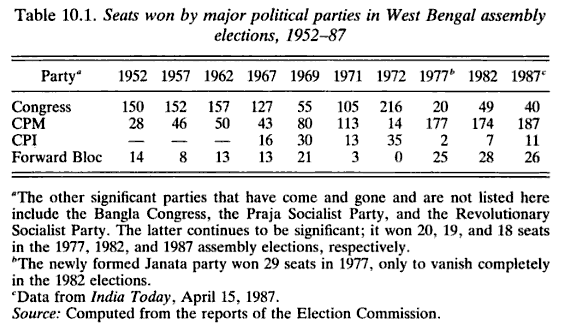 Many progressive Bengalis looked at the party as a pro-poor, progressive force in West Bengal during the 1980s. But substantial and rising criticism has developed in the past five years. So where is CPM today? First, consider the positive view. Distinguished American political scientist Atul Kohli treated West Bengal in detail in his The State and Poverty in India (1989), and he credits CPM for much of the improvement of the status of the poor over a 20-year period in West Bengal. After having been one of India’s most chaotic states in the late 1960s, West Bengal has emerged in the 1980s as one of India’s better-governed states. Surely there are lessons in this turnaround for any study of India’s growing crisis of governability. For purposes of this concluding discussion, these lessons can be broadly divided into prescriptive and analytical. The prescriptive lessons are limited. What has worked in West Bengal may not work in other states in India — and is even less likely to provide an all-India model. 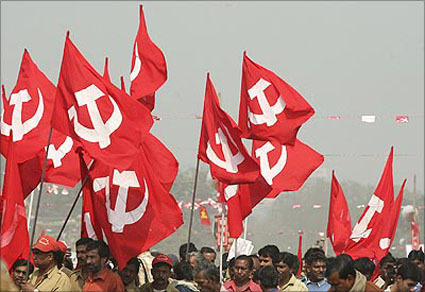 The emergence of the CPM as a disciplined ruling party in West Bengal is a product of an unusual sociopolitical configuration — its long regional traditions of elite radicalism and centralized organization, the weakness of caste as a principle for political organization, and the historical weakness of the Congress party…. In spite of the limited utility of the West Bengal case for generating any direct prescriptions, the analytical implications … are very important. The West Bengal case highlights the significance of a well-organized reformist party for generating political order. The roots of the political chaos between 1967 and 1977, though complex, were mainly two related political conditions: the fragmentation of the state itself, and virulent elite-led mobilization. The emergence of the CPM as a ruling party tamed many of the conflicts within West Bengal. As a well-organized party with a clear electoral majority, the CPM was able to create a cohesive government and fill the existing power vacuum. Organizational discipline also enabled the CPM to limit elite factionalism and the debilitating elite-initiated political conflicts that often follow. Thus, organizational cohesion at the heart of the state was crucial for taming political chaos. The governance failures of West Bengal, on virtually every indicator that matters — roads, health, education, nutrition, poverty, infant mortality — have recently been well documented in searing report by my colleague Bibek Debroy and his co-author Laveesh Bhandari. Even the much touted success in growth in agricultural productivity and decline in rural poverty has been tapering off for years. There is no question that West Bengal is ripe for a paradigm shift in its development model. There is also no question that the local CPM has become a huge obstacle to the progress of the state. No matter how much Bengali intellectuals, out of a sense of misplaced nationalism, sanitise the issue, the CPM’s implication in violence, intimidation and coercion is extensive. It is now deeply implicated in the political economy of petty corruption in the state. It has virtually destroyed intellectual life in main institutions of the state. The irony is that even though the CPI-M has become pro-capitalist, it has little respect for democratic norms or rule of law. So, even before the State Government machinery, centred in Kolkata, actually made any formal requests to peasants for taking over of their lands, a local party bigwig and a Member of Parliament from adjoining Haldia (it is a port town and is apparently booming) deemed fit to send out a circular stating that lands of villagers in quite a few villages will be taken over for the purpose of creating an SEZ. That created a furore among the villagers and a resistance started; they vowed that they will not part with their land which they have tilled for generations. The State Police tried to break the peaceful resistance of the villagers on March 14, and the deaths of innocent peasants led to a plethora of protests from the Opposition political parties and groups and also from independent intellectuals of Kolkata and beyond. Even Gopal Gandhi, Mahatma Gandhi’s grandson and the present Governor of West Bengal, found the killings to be a horrific incident and himself tried to visit the place where the deaths happened but was stopped mid-way by the CPI-M cadres. The criticism is two-fold: that CPM’s current economic policies are too favorable to international businesses; and that the government has been reckless in its use of force against peasants and critics. Here is a rebuttal to these criticisms from LeftVoice. The document is interesting because it provides a defense of CPM’s current policies and actions (link). The primary political and developmental strategy of the Left Front had two inter-related components – land reform and decentralisation of political power from the state bureaucracy to institutions of local government (i.e. to panchayats and municipalities in rural and urban areas respectively). Right from the start, it was the contention of the Left Front, that refoming the way land was owned in the rural areas, where the bulk of the poor lived, was crucial to tackling the problems of poverty and under-development in the state. In this article we shall see what kind of property relations existed in the state before the Left Front came to power in 1977, how these relations created conditions of massive rural poverty, how the Left Front attempted to undertake land reforms to alter these property relations, how it realised that decentralisation of political power to local government institutions was the best way to undertake such reforms and how this whole strategy reduced rural poverty and also politically empowered the poor in the state to a degree not seen in other states of India. So the hard question today is this: has CPM maintained the political commitments and integrity it evidently possessed in the 1970s and 1980s, so that it remains a positive force for social reform in West Bengal? Or has it devolved into “party politics”, leading to behaviors that have more to do with personal gain and party electoral success than social progress?